In honor of an ever-expanding line of foot-powered vehicles, let’s talk about collecting! Pedal cars are hot collectibles that come in countless styles, and they’ve been coveted by both kids and adults since the very beginning. Say you’ve scored a cool vintage pedal car at a yard sale, flea market, or online auction. Your first step is to identify your new old vehicle. If you’re lucky enough to have found a car with the paint job intact, you might still be able to see all or part of the brand name. Some models, like the Murray Kidillac, have the name printed along the side. But it’s quite possible your well-loved little car may have no trace of a maker’s mark. If you’ve picked up a pedal car that’s a bit worse for the wear (i.e., a hunk of car-shaped rust!) identification can be a bit trickier. Even if there are no identifying marks, you can still glean a few clues with a close look at your car. The first thing to study is the construction. Pre-1945 cars often had details like real windshields and bumpers, while the post-war pedal cars dropped some of the detail in the interests of mass production. Cars from the ’50s and ’60s were usually made from a solid piece of steel. Plastic is a good indicator of a newer pedal car, which means yours could date anywhere from the 1970s & up. 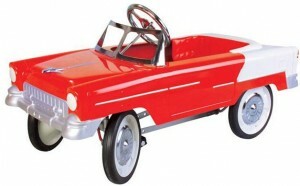 Many enthusiasts opt for durable reproductions, like this 1950s Classic Red Pedal Car. Another thing to consider is the style of car. Pedal cars were often produced to match cars of the day and many Cadillacs, Fords, and Chevys came in a “mini-me” size. So if your little Ford T-Bird looks like it just rolled out of 1955, there’s a good chance that could be the case. As with most collectibles, buyer beware holds true in the pedal car market. 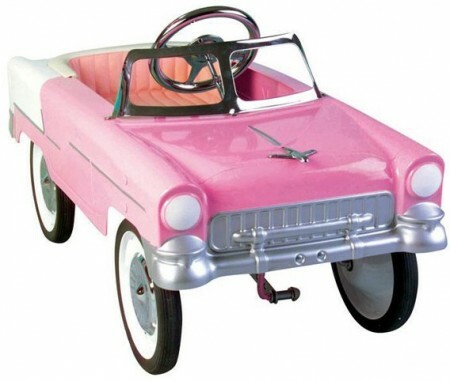 It’s a good idea to familiarize yourself with pedal car reproductions. While these can also be collectible, you want to make sure any “for sale” ad claiming the vehicle is vintage rings true. If it looks just like a reproduction (which can look nearly identical to their original counterparts), it may have been intentionally aged to look antique or a well-meaning seller may have mistaken a car left out in the rain a little too long for an original. Now, the all-important question for those who’ve acquired an original… Should you restore a vintage pedal car? This is a personal choice that is dependent upon the amount of time, money and sweat you’re willing to put into your car. Gearheads might be up to the challenge of making an old car look new again, while others may opt to let someone else have a crack at restoration. Prices vary, but restoration is an investment – though one that will ultimately increase the value of your pedal car. Some may prefer to leave cars weather-beaten for an especially vintage look. Finally, you need a spot to display your treasure! Pedal cars were made to be enjoyed, and even if you can’t let the kids ride it, you can still show it off. A place of honor beside a full-sized retro car is always a fun choice. And if you live in an area where the weather is nice and don’t mind exposing your car to the elements, you can display it in your yard or garden. Another option is to display your pedal car with an antique toy collection or as part of a retro room. The opportunities are as endless as your imagination. Do you currently have a pedal car collection? Do you prefer restored or well-loved? Have you made any fantastic flea market finds? Tell us about it below!